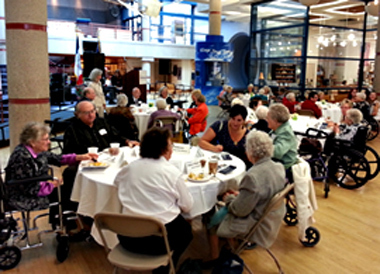 Centenarians were celebrated Tuesday at the State Historical Building. Around 200 Iowans became or will become centenarians this year and the Iowa Department on Aging honored those residents with a celebration Tuesday at the State Historical Building in Des Moines. Velma Newman was one of 15 people who turned 100 years old this year to attend the event. Newman said there are probably two key factors to her long life. “I’ve never smoked and I’ve never drank. That’s about all I can tell ya,” Newman said with a laugh. Velma, who now lives in Indianola, and her husband, Jessie, were married for 62 years until his death. The couple ran many businesses together, including two gas stations, a retail store, a hotel and a Dairy Queen. Newman said she tries to remain active and one of her favorite hobbies is crocheting – something she’s been doing since she was eight years old. “I crochet for church…scarves and things like that,” Newman said. “I try to make something, you know, that someone can use.” Newman has made and donated thousands of scarves, afghans, baby blankets and hats to charities. Esther Spangler, like Newman, was born in March 1912. She was the youngest of six children and grew up in three-room house on a farm near Exira with no running water, inside bathroom or electricity. Looking back on the difficult times early in her life, Spangler said young people today don’t have it so easy either. “I don’t think we had the worries that you do now, maybe. Sometimes I think it’s a rough world out there,” Spangler said. Esther was married to her husband, Beryl, for 57 years. After his death, Esther traveled with tour groups to Alaska, Germany and Switzerland. According to the U.S. Census, there are 846 Iowans who are 100 years or older. Iowa’s oldest resident is also the second oldest person in the world. Dina Manfredini is 115. The Johnston resident will turn 116 in April.